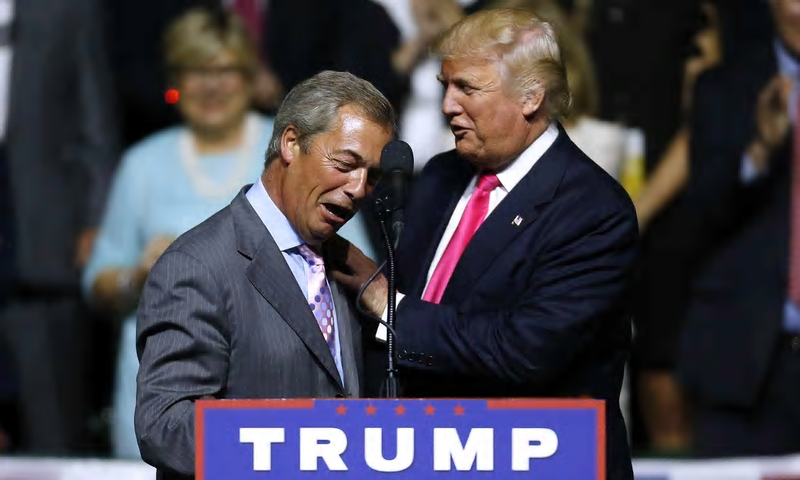 The Grauniad alleges that our Nige is now a ‘person of interest’ in the FBI investigations into Russian connections to the Trump cabal – which the UK’s favourite MEP calls ‘hysterical’. Let’s hope his spoon was long enough last year to justify his present mirth. Since I think anthropomorphic climate change is a load of rubbish, I have no problem with Trump or anyone else opting out of any agreement that thinks it can change the world’s climate. Don’t get me wrong, I have no problem with cleaning up the world’s environment – in fact I think that’s an extremely good idea. But, it’s a totally separate issue. And as far as I can see, many global companies are doing their best and will continue to do their best to clean up their act – regardless of what Trump says. They do, after all, operate in countries that demand that they ‘clean up’ their act. Unfortunately, in my (not so humble) opinion, the biggest pollutant is humanity. We cannot continue to breed, breed and breed – there are just not sufficient resources to sustain an ever growing population. But, no Government seems to be willing to even mention this problem – let alone deal with it. The religious (nutters) want to increase their flock of devotees and claim that their religious ‘freedoms’ entitle them to produce lots of little religious nutters – and no one has ever asked them for the phone number of their particular deity to ask Him / Her for advice on how to feed His / Her ever-growing number of followers. And… Big Business and Governments are addicted to continual “growth” to boost profits for the few, rather than the idea of “sustainability” which would allow an equitable distribution of resources between those who provide employment and those who are employed. The present system is not a healthy balance. As for Farage’s comment – he is right. Trump went to the American people with a programme. Shock! Horror! He’s actually trying to do what he said he would do. What a novelty. Beware of what you ask for…. Boadicea: The problem is that the Paris Accords were never about the environment — none of these rounds ever were. Some very wealthy people make a fortune on vanity projects. They’re in the position to make generous campaign contributions to politicians seeking the perks of office. Said politicians are thus beholden to them. If it truly were about protecting the environment at any cost, the Chinese and Indians wouldn’t have agreed to be bound by anything. Both are far too concerned with economic dynamism and keeping their populations from revolting. That, and they’re extremely touchy about issues of sovereignty. No, a lot of politicians — especially in Europe, but in the US as well, want to be seen as “virtuous” and oh-so-with-it. They want to make names for themselves whatever the cost for their citizenries. As much as Trump grates me, he’s actually, as you said, doing his best to stay true to his word. However boorish and contradictory he is, he does seem to actually be trying to do right by most people and he’s refreshingly un-PC. Boadicea: Are you sure you’re not my long-lost sister? It’s hard to imagine myself being so much in agreement with anybody else. Of course the climate is changing! The globe has been warming entirely on its own ever since the last Ice Age. The things we retards spew into the atmosphere probably don’t help retard the process but surely ought to be of far more concern to the health-conscious. Politicians and industrialists will, unfortunately, do what they always do: buy opinions that agree with them from “scientists” unable to resist the lure of a fat “research” grant. Sad to say, campaigning against the dread Global Warming has become an industry all its own, with great profits to be had by the unscrupulous. I can’t help wondering whatever happened to two US Gummint-funded studies that were published some years ago. My guess is that they ran into difficulty contriving a practical means of collecting enough bovine flatulence to use as fuel. As for breeding, I’m very fond of the way the issue is neatly put by the resident Head Gardener: “Don’t breed what you can’t feed!” I hate to find myself thinking this way, but the odd war may serve a purpose greater than settling some petty border dispute. And let’s not even begin to think about genetically selecting humans as we do our farmed animals and plants. The last time that was tried left altogether too bad a taste in people’s mouths and no politician nowadays would ever dream of hinting in that direction. I’m glad that I won’t live long enough to see this play out as it seems likely to, although I do fear for my children and any offspring they may produce. Boa, I’m sure living in the industrial megacities of the third world is just as it was in Coventry in the ’40s. The sky is never blue, the air is never fresh and winter fogs are yellow. That’s not global warming – nor is it climate change! Gubmints are dealing with it because people who live there won’t have it any more – but unfortunately poorer countries want richer countries to pay for the clean-up. Unfortunately the spin employed by gumbints deliberately confuses pollution and global warming. Janus: In China, when it rains regularly, it’s possible — just — to see mountains a few miles in the distance. If it’s dry for a couple weeks it’s hard to see more than 100-200 yards. One also coughs regularly. Hello Boadicea. I agree with most of what you say except for the fact that you blame the ‘religious nutters’ for the ever growing populations. I infer that you believe everybody who is religious must be a nutter, but maybe not. There is almost zero population growth in large parts of Christian Europe. While here in sunny Zimbabwe and most of Africa where organised religion with established elders, leaders and dogmas is rare, the population grows unabated. Yes there are missionaries and western churches but their impact is negligible. Primitive tribal instincts, including witchcraft have more influence. It is not the religion that is the problem, it the politically correct liberal elite who are to blame for the ceaseless population growth that we are witnessing. The Bill Gateses, Bonos, Geldofs, Oxfam, DIFID, USAID, Medicine Sand Frontiers, UNHCR, UNICEF etc, who insist on encouraging people to breed and survive in an environment that without foreign assistance they be unable to do. We should also look to blame Thomas Jefferson for propagating the concept that ‘all men are created equal’ and Woodrow Wilson for the idea that all peoples have a ‘right to self-determination’. Complete and utter nonsense. It is my absolute belief that the PC dogmas emanating from the West are every bit as damaging and insidious as the dogmas of the Catholic Church that sort to deny the scientific discoveries of people like Galileo in the 16th and 17th centuries. In fact they are worse, because they will lead to the destruction of civilised society within the next generation. Unless something is done to stop the destructive effects of multiculturalism coupled with an exponential population growth in the 3rd world, Africa and the Middle East in particular, Europe will cease to be in a very few years. You really have no idea how Africa is going to invade the rest of the world and destroy its culture and ethnicity like a malignant cancer. The West has the power to stop that now but the PC brigade will not allow it. I only need to point to the example of James Watson, Nobel Laureate. Look what happened to him when he dared to make a claim on the intellectual disparities of races. The western society that I imagine most readers here would like to protect, came about very largely because of Christianity. Heathenism, atheism, paganism or whatever, would not have brought about the levels of civilisation we see to day. While atheism may thrive now, it can only do so because religion, in our case Christianity created the environment for it to do so. At some point, a powerful entity of some sort, is going to release a mass sterilisation program that will see hundreds of millions, billions even, of people being denied the ability to procreate. My money is on the Chinese, but I would not put it past our friends in the Middle East. It has to happen either that or a plague of some sort. Cog: I think we are siblings in an ever-diminishing family of those who check facts. analyse proposed solutions, offer alternative views and remedies and are not afraid call ‘b***t’ in the face of the determined opposition of those who want to be all things to everyone – Christopher’s ‘virtuous’ and ‘oh-so-with-it’ people in power. Sipu – your defence of Christianity is so predictable and so boring. The three major religions: Christianity, Islam and Judaism all promote large families. The fact that Europe has a low reproduction rate is down to the fact that, by and large, Christian Europe has learned to pick and choose which bits of their religion they will adhere to. Islam has not yet reached that point, and, as long as European governments continue to fund large families, people will continue to breed replicas of themselves – because they can afford to do so at the expense of others. By the way, like Janus, I’m with Jefferson. The Chinese were pilloried for restricting the propagation of their people – which was intended to help them to avoid starvation. As you say Boa, those who claim supernatural rights to existence refuse to do it. The White Supremacists too demand birth control only for inferior races – a simple solution, at least for themselves. Janus: China’s birthrates were artificially high during the Mao years. Mao encouraged women to have as many children as possible in order to swell his “socialist army”. He had been aware for years that this would eventually lead to China’s social collapse which only encouraged him to keep with it. Social collapse was his desired outcome.That way, a “new China” could be effectively be crafted. Now that’s what I call social engineering! The one-child policy only applied to Han Chinese, not to ethnic minorities. Farmers were permitted two children if one was a daughter. Recently, the Chinese government has changed that law so that single children can have two children. Even though they can, they frequently won’t, have more than one child — if they have any children at all. Too expensive, different priorities, etc. are the reasons given. Interestingly, Iran and Lebanon have birthrates of 1.71 per woman and birthrates in Algeria, Morocco, Tunisia, Bangladesh and even Egypt have gone down tremendously in recent years. In France many women of North African extraction have large families because it’s the only way they can secure housing and enough income. Definitely the same situation in the UK with many immigrant families! As such, cutting child benefit to two families would mean that the large majority of “working poor” would not be affected, but benefits scroungers would lose a major source of income — and reason for having very large families. Incidentally, the Hassidim in Israel have recently had to re-evaluate their priorities. The Israeli state can no longer support people with massive families for decades. The old canard that they need to complete their religious studies doesn’t hold water when the social system is running out of funds. They can take their lessons between public service and employment. PS: I’m with Janus and Boadicea vis-a-vis Jefferson. The Chinese, incidentally, weren’t too off, either. That they focused on “managing inequalities” wasn’t based on class or even ethnicity. Rather, a farmer probably shouldn’t be micromanaged by an urban merchant and a magistrate had to respect the fact that he wasn’t a craftsman. People had their strengths and weaknesses and were to focus on what they did best to avoid stomping on toes. The idea that the Chinese would interfere with fertility levels outside China betrays a brazen ignorance of Chinese society and the Chinese world-view. The Chinese don’t give a toss if people in Niger or Chad have 7 children, it’s not their problem. Interfering means claiming responsibility and the Chinese can’t even keep China under control. Boadicea, thank you for your charming put down. I hope to be able to respond more robustly when I have time. Next Next post: Using Barbarians to Control Barbarians.